Product prices and availability are accurate as of 2019-04-12 08:56:38 EDT and are subject to change. Any price and availability information displayed on http://www.amazon.com/ at the time of purchase will apply to the purchase of this product. 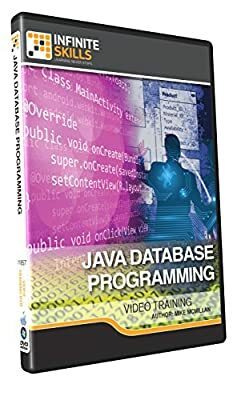 In this Java Database Programming training course, expert author Mike McMillan shows you the concepts and tools you will work with in order to successfully build functional database programs using the popular programming language. You will start out by setting up a database using MySQL. You will learn how to create tables, insert and query data, and update and remove records. From there, Mike will show you how to use Java to connect to MySQL. This video tutorial will also teach you advanced database techniques, including installing, setting up, and creating tables in NetBeans. You will learn how to create a Java/MySQL App and a NetBeans Platform App. Finally you will learn how to use the built-in Derby database in NetBeans. By the completion of this computer based training course, you will have developed the necessary knowledge and skills needed to create exceptional database programs with Java. Working files are included, allowing you to follow along with the author throughout the lessons.